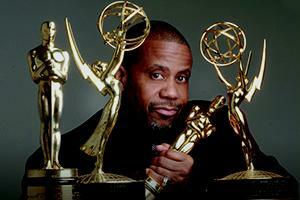 SOC professor donates two Academy Awards to the new African American history museum. AU's Russell Williams with his Oscars and Emmys. Time for a pop quiz! Who is the first African American to win two Academy Awards in any category? Sidney Poitier? No. Morgan Freeman? Nope. Denzel Washington? Wrong again. The correct answer is American University's own Russell Williams. In back-to-back years, he won Oscars for his sound work on Glory (1990) and Dances with Wolves (1991). Watch video of Williams accepting his Academy Awards. Williams, now a professor of film and media arts in AU's School of Communication, recently donated his two Academy Awards to Smithsonian's National Museum of African American History and Culture, which is slated to open in 2016. No longer just a part of African-American history, he's made his contribution to commemorate it. He's also donating two Emmy awards, photographs, and some of his film-related equipment to the museum. Since Williams is a voting member of the Academy of Motion Picture Arts and Sciences, he has extensive knowledge of the Academy Awards. On the eve of this year's Oscars, Williams talked about the politics and intrigue of the treasured golden statuettes. The term "Oscar snub" now has a place in the American cinematic lexicon. Film historians and critics complain that Academy voters sometimes get it wrong. Many movies later categorized as all-time classics in rankings from the American Film Institute (AFI) or the prestigious Sight & Sound Poll failed to win recognition at the Oscars. "I think the Academy voters, traditionally, if you look at the voting record, very rarely pick the movie that's on the cutting edge. They generally go for the softer option," Williams says. The oft-mentioned best picture dispute was the 1980-1981 race. Robert Redford's Ordinary People, a respectable but not historically-significant family drama, beat out Martin Scorsese's blistering boxing masterpiece, Raging Bull (named the fourth best American movie of all time in AFI's most recent ranking). Citizen Kane, often called the best film ever made, was nominated but failed to win at the 1942 show. Williams says director Orson Welles probably suffered blowback over his movie's thinly-veiled portrayal of newspaper tycoon William Randolph Hearst. "With his newspaper empire, [Hearst] had pretty much threatened movie exhibitors that if they showed that movie, they wouldn't get any advertising in his newspapers. And I think there was a lot of pressure on the voters to ignore the film, even though it was one of the greatest feats in cinema," Williams explains. Williams says Gordon Willis, the cinematographer for The Godfather, was on the receiving end of an inexplicable Oscar snub. Williams describes Willis's cinematography on the film as revolutionary—inspired by master painters like Rembrandt and Caravaggio, while at the same time innovating modern cinematic techniques. "He really kind of stretched the limitations of what film was able to do by keeping it very dark. And using just pools of light here and there that highlighted what your eyes should go to in the scene," he says. "Pretty much all cinematographers from 1972 on have tried to duplicate that." Despite Willis's influence throughout the 1970s, he didn't receive Oscar nominations until his work on Woody Allen's Zelig (1983) and The Godfather Part III (1990). Hollywood has long had a complicated relationship with race, a predicament now coming into sharper focus with the controversy surrounding Selma. While the movie is up for best picture, Ava DuVernay didn't get the nod that would have made her the first African-American woman ever nominated for best director. The Academy is predominantly male and Caucasian, and Williams doesn't see that changing in the near future. And on race-related films, Williams again sees a tendency of voters to choose less provocative options. This belief extends to how African-American actors and actresses are evaluated. Williams compares two 1996 performances by black actors: A grief-stricken Samuel L. Jackson in A Time to Kill (not nominated) versus the mostly humorous Cuba Gooding Jr. in Jerry Maguire (the best supporting actor winner). "As far as I was concerned [Jackson] should have been a lock for his role in A Time to Kill. But that's a hard movie to look at, and it's not easy subject matter to digest." Last year, the best picture Oscar went to 12 Years a Slave, a brutal, unflinching depiction of American slavery. Williams opines that its setting, the antebellum South, may have made it more palatable for voters. "I was really happy and surprised at the amount of nominations it received," he says. "Maybe it's because the voters are looking at something that they know is well beyond their lifestyles and their life memories. These other movies, like Fruitvale Station, The Butler, and Selma, have basically taken place in their lifetimes. So maybe [those] make them more uncomfortable." Williams talks about how the complicated voting process can lead to unpredictable results. Each branch votes to nominate people in their own field of expertise, so sound voters choose which movies should be nominated for sound. But in a separate ballot, anyone in the Academy can vote for best picture. "That's a great example of how a movie could be ignored in say, the acting category or the directing category, but it could still get a best picture nomination," he explains. Also, seeking Oscar attention can be akin to a lobbying or public affairs campaign. Technological developments now allow almost anyone to become a filmmaker, but making a movie visible to Academy voters still takes money and marketing, he says. "You're buying ads in the trades, like The Hollywood Reporter or Variety. And in major newspapers like the Los Angeles Times and The New York Times, there are big, long articles about, 'How was the costuming in this? How did they achieve the visual effects in Interstellar?'" Even the cost of sending out the DVDs to guilds can add up, he says. "If you're a small filmmaker and a small distribution company, it's going to be hard to compete with that onslaught." Williams is originally from Southeast, Washington D.C. Though he enjoyed movies at a young age, his early attention to sound sprouted from music. He started taking piano lessons, appreciating European concert music and later jazz. While earning his undergraduate degree from American University, he spun vinyl records at the college radio station. An early influence was the 1967 movie In the Heat of the Night. Movie fans still recite the famous scene, when Sidney Poitier proudly thunders, "They call me Mister Tibbs!" But in that movie, Williams also noticed a key African American producing music behind the camera: Quincy Jones. Williams eventually decided to pursue film, and he applied for a directing program at AFI. Despite getting rejected, he received a tax refund from the work he was doing in D.C., and he used the money to head west. "I said, 'Ok, there's more than one way to get to L.A.," he recalls. "If I didn't go out there, then the rest of my life I would have been like, 'Suppose I had tried?'" He took a leave of absence from work. "I had 90 days with no pay. I could either sink or swim," he says. As a non-union member, he was able to find work on documentaries and various industrial, corporate training films. After toiling in the industry, he landed his first big movie with Field of Dreams (1989). When he saw screen legend Burt Lancaster on the set, Williams realized he had arrived. "He was one of those guys my mom was in love with when we'd go to see all his movies," he says. "That's when I really felt that after the nine years I had spent so far, that it was worth leaving hearth and home, family and friends, and going all the way across country." Williams still remembers his own Oscar experiences in vivid detail. Twenty years after his second win, he returned to L.A. for the awards show. His career had come full circle. As a gift from her estate, Katharine Hepburn's four Academy Awards went on display at the National Portrait Gallery in 2009. This was rare: Oscars are such cherished prizes, few winners or their families have ever parted with them. Yet Williams felt this was the right thing to do. "People thought I had lost my mind, but I'm a D.C. guy and I've always loved the Smithsonian. So I'd rather have them here."